Ivory Coast thrashed Madagascar 5-0 to maintain their 100 percent record in Group One of qualifiers for the African Nations Cup in Bouake. Goals from the Chelsea duo of Salamon Kalou and Didier Drogba, together with one from Yaya Toure and a brace from Arouna Kone, kept the Elephants comfortably top of a group in which they are yet to concede a goal. The Madagascan defence - which had already let in seven goals in two games - held out for only 18 minutes before Kalou pounced. Kone then netted his first of the day on 37 minutes, and Yaya Toure effectively killed the game just after half time with his 47th-minute goal. And two more in the last eight minutes - Kone's second before Drogba got his name on the scoresheet with three minutes to go - gave an emphatic edge the scoreline. 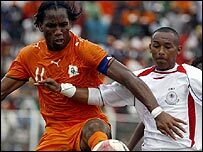 The match was being played in the northern city of Bouake, rather than Abidjan, as part of the peace process in the country. Ivory Coast will not now play another qualifier until September - their next game would have been against Djibouti, who have already withdrawn from the group without explanation.